The tarot card thunderbolt symbolizes a sudden commotion caused by a sudden tragic occurrence with regard to our life, imagination, values and relationships. The card thunderbolt shows strong stormy weather. There are threatening thunderbolts in the sky at night and firs and pines are bent by the wind. Now time has come for clearing when the morning after resplendent in brightness. 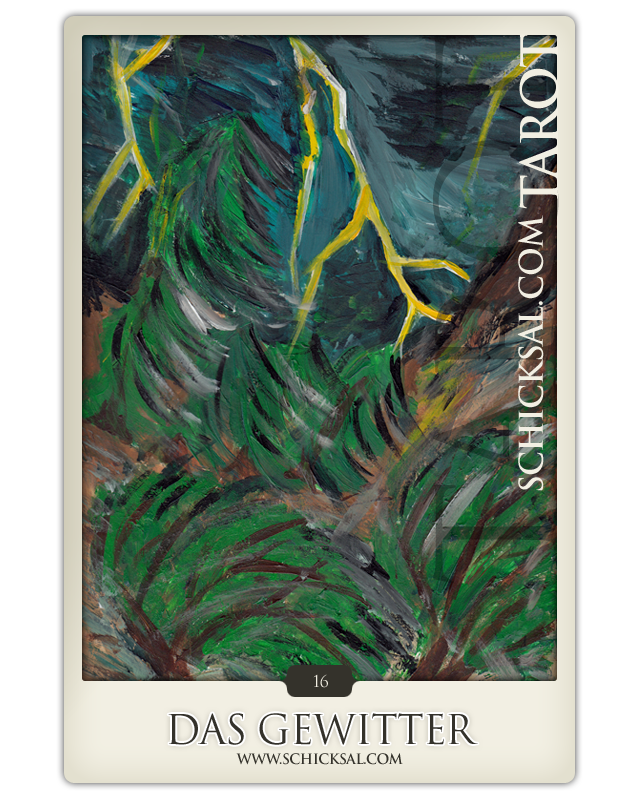 The tarot card thunderbolt symbolizes a sudden commotion caused by a sudden tragic occurrence with regard to our life, imagination, values and relationships. Occurrences are running out of control and discomposure is shaken your mind. Now and then it is time to realize that changes and challenge have come. That wake-up call startles someone out of his meditation and dreaming. That loss of secrecy and convenience senses strange and causes fear with consideration of all new parts, casts and roles that are coming inevitably. But after all these parts and processes of developments you will set sails again! The clearing changes and purification makes a difference after all that had happened. You will awake with a smell of fresh air and anew set sails towards the horizon. Time has come for a new direction and a new part in your life. It seems to be useful and necessary to be shaken and therewith to come to know that the time for a change has been coming. Sometimes sentimental values have been destroyed by struck but finally in the end the new horizon appears much more easier. Maybe there were too distinct ideas or dreamings that could not stand realty. Maybe there is a failure of a project but urgently return to truth and reality bring out new perspectives. The thunderbolt is a challenge to discover new borders in an affirmative and wilful way. The dark side of the card thunderbolt is time consuming process to wear somebody down. It would not have been realized to strike and escape. Destructive frenzy and aggression are common evil partners and counsellors. Commotion and fear are attributes to hide away at best. The best consultation will be to achieve spirit for energizing. An unexpected confrontation can shaken your relationship routine. Meanwhile you are confronted with a rude and ungentle awakening. Maybe a crisis could cause the process of separation or divorce. Herewith there are a combination of former limitations and pattern of behaviour that do not work anymore. They should have been quite right in the past but occasionally they are no more up to date and they are longing for new necessity. It offers an imperative for room of each other. Profession is ill-fated as well. The thunderbolt event promises uncomfortable times. Something fiery, disturbing and stirring comes into your life – or becomes revealed now. Expect the unexpected in those days when the thunderbolt is on! However, be prepared for a blow of fate! But count on a better future and prospering development after failure. Do not lose your hope and your faith Cross the border and do not have any high-heeled expectations at the moment – but after all you will choose a way much better for yourself. Correct your wrong decisions that were destined for your past. Most likely you will be glad when this day will be over soon. Maybe there is strong stormy weather and you were confronted by an occurrence that makes a distinct determination. Do not head any marvellous expectation. Stay seated in reality. This should be a perfect day to exercise: do yoga and meditate. Return to calmness so by the way you will be stronger after that for new challenge.